Growing up, I was a generation removed from the military. My dad’s dad fought for the Army in the Korean War; my maternal grandfather (who died before I was born) also served in the Army, as a doctor, during World War II. Donald Francke was an Army sergeant, serving four years during the Korean conflict — two of them stationed overseas in the Republic of Korea (South Korea). J.B. Cole, a captain, treated wounded soldiers in the strategic Panama Canal Zone. His brother, Hugh, died on a U.S. submarine and was awarded the Purple Heart. His brother’s sub was never recovered, and my mom said her father could never talk about Hugh without tears in his eyes. My mom and dad were proud of their parents’ service and sacrifice, but it always felt distant to me. Like I said, I never met one of my grandfathers, and, sadly, I don’t recall ever hearing the other talk about his time in the military. He died in 2004, when I was 16. My wife has been touched more closely. Her father, Stephen Hutchinson, a National Guard member, died when she was 3, after suffering an acute heart attack during a training exercise. Both of her grandfathers also served their country. Her mom’s dad was enlisted in the Navy during the Korean War. He’s still with us today, and he has told me many tales of his days at sea. But the most famous story comes from her paternal grandfather, William Hutchinson, who was a merchant mariner with the U.S. Navy Auxiliary. Barely 11 months after the notorious attack on Pearl Harbor, he survived the torpedoing of his vessel in the waters near New Caledonia — but only because of the heroic actions of a shipmate. On Nov. 8, 1942, the ship was struck by an underwater missile fired from a Japanese sub. Hutchinson was an oiler, working in the engine room at the time of the blast. An engineer and fireman were killed in the explosion, and he was injured and temporarily incapacitated. Enter William Morris Thomas, a 22-year-old cadet-midshipman from Alameda, Calif. The blast startled him from his bunk and knocked out the power. Alone and in the dark, he quickly made his way to the downstairs engine room, trying his best to avoid tripping over debris and other hazards. At the bottom of the stairs, he yelled into the blackness, and a weak voice answered. “I’m Hutchinson. I’ve been hurt,” my wife’s grandfather, then 25, said. Thomas maneuvered his way toward him, lifted him onto his back and carried him all the way to the deck. Then, he found a line, lowered him to sea, dove in, cut him loose and floated with him on a makeshift raft while their ship — the Edgar Allan Poe — listed. They were rescued the next day by a battleship. 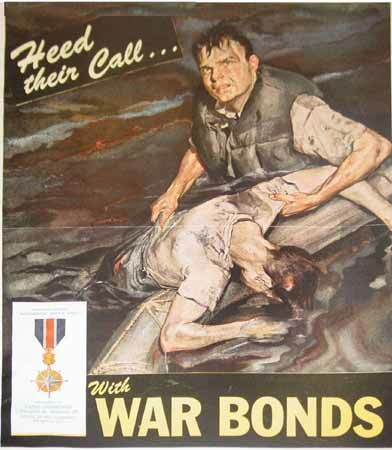 A painting of Thomas’ daring rescue (with my wife’s granddad in his arms, face down) appeared on the cover of the Dec. 11, 1943, issue of Collier’s magazine and was immortalized in an ad for war bonds. He was later awarded the U.S. Merchant Marine Distinguished Service Medal for his bravery, though surviving records indicate that he downplayed his heroism. Hutchinson lived the rest of his life with shrapnel in his body. He also sustained severe head wounds and other injuries, from which he did recover. The write-up in Collier’s says Hutchinson “asked to go back to sea immediately,” an attitude Thomas called more heroic than what he did. These stories are not merely historical curiosities; they echo onward, even today. Safe at home, snugly ensconced within the comforts and familiarity of our everyday lives, it’s easy to forget that our nation is still at war. But it is, and has been for more than 13 years. For me, that means that more than half of the time I’ve been alive, my country has been involved in a complex, brutal and deadly military conflict on the other side of the world. Both my wife and I have numerous cousins and friends who have joined the military or otherwise pursued military careers. Some have served in Iraq and Afghanistan; others are facing deployment in the coming weeks and months. I’m no war hawk myself, and honestly, I find it difficult to think about such modern-day conflicts without brooding over the politics of them. I’m also not much for sappy, patriotic melodrama, with which you may find yourself inundated as Memorial Day draws steadily nearer. But I also believe in giving credit, respect and honor where it is due. And I can think of no act more worthy of honor than someone sacrificing his or her life so that others might live — because there is no act more worthy. According to some polls, as much as 80 percent of the U.S. populace has little to no knowledge as to the meaning and purpose of Memorial Day. It’s a day off, a chance to catch up on yard work, an occasion to spend some time with family, an excuse to fire up the grill or dig out grandma’s famous potato salad recipe. I don’t think it’s wrong to celebrate. Solemnity has its place; as does joy and peace and celebration. But I think it will make for a far more meaningful celebration if we all take the time to pause, reflect and recognize why we have the opportunity to celebrate in the first place. A version of this column was published in the Woodburn Independent on May 14. Hello. Thank you for your thoughtful words. My father (William M. Thomas Jr. 1921-1977) would be happy to see that Hutchinson had children who had children. God bless you.